A textile trip in Guizhou – Guizhou C.I.T.S. D01 We start to fly from home. D02 After 10hours, we arrived in a China airport and then continued to fly to Guizhou, and then we met our Guide in the airport and we were all put into a bus and drove directly to Kaili, the capital city of the Prefecture to Southeast Guizhou. Eating a delicious Chinese dinner. Being tired after such a long way! D03 Today we went to attend the opening ceremony of the Festival. The minority Groups were parading on the street in different types of the most beautiful festival costumes. The long-skirt, the short-skirt, the high-mountain, the river-side and a few other unknown Miao groups were making the whole town colorful. Several activities were being done during the day and night, the buffaloes fighting, the birds fighting, singing and dancing competition, the Miao ‘fashion show’, the Dragon canoes racing, during the evening, fireworks were lit, and bonfire party were on. I wished I could have had more than two eyes! D04 In the morning, we drove over 2 hours to smaller town to see the festival celebrations. It was said, the Sister Meals Festival in fact was started from here by the ‘river-side’ Miao people, different traditional activities could be seen. And some traditional techniques were shown in the villages as well, very special and interesting. We stayed overnight in the village, in a simple basic guesthouse. D05 During the daytime, there are some other activities, dancing, singing, Miao wedding show, horses racing and so on. We enjoyed all of them. In later afternoon we had to drive back Kaili. D06 In the morning we went to the Miao village which was famous for the folded-cloth embroidery, two-needle embroidery and knot embroidery. We were welcome by the Miao women with rice wine by singing drinking songs. Then the demonstrations to weaving, spinning and embroidery were started by these skillful ladies! We all opened our eyes widest to see each step! 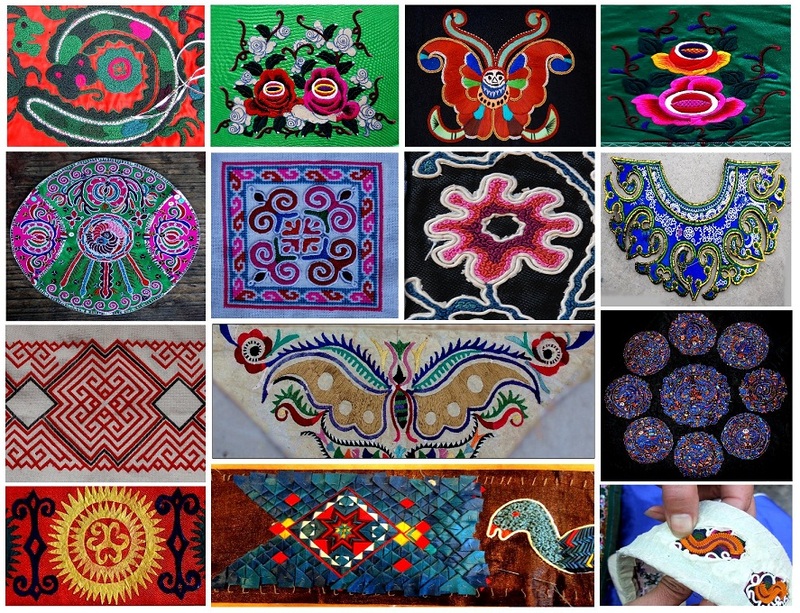 Up-side-down embroidery with orange thread and batik with special patterns and braid weaving were three special skills by the Gejia people. We visited them in the afternoon. D07 Today we drove to visit Lusheng Festival in a Miao village on the top of the mountain surrounded with other Gejia villages! There we saw the Miao group with different costume style, the shining cloth dyed with indigo by adding special chemical color. The young girls were wearing hats with embroidery and cross stitches on them as their jackets and long skirt! 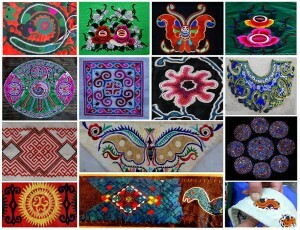 D08 The embroidery with silk felt by being cut into different patterns, mixed with some tin as well, and ‘’flat thread’ embroidery, braids weaving and scarf weaving with silk thread are the special technique in these Miao villages around Zhouxi. In Shiqiao Miao village, the paper made in traditional way could be seen in many houses. By the way we visited the Miao village where the birdcages were made of bamboo. D09 Driving from Danzhai to Rongjiang after visiting the terrace by a Miao village, we were mainly going to visit a rural market. In 3 hours we came to the beautiful market, which were on every 7 days, where we saw two different types of Miao costumes, Shui and Dong people as well, and all in very traditional colorful costumes, we bought some silk thread, braid and other small things for use on textiles! D10 After visiting the Sunday market here in Rong, where we could see different type-costume of Miao people, Dong people and Shui People, another interesting market. Lunching here and then driving for 3 hours to a Miao village, the unbelievably magnificent terrace paddies appeared in front of us, they looked like the five-line staff notation written on a white silk cloth, black and white contrasted more obvious in the light of sunset (Guizhou terrace! ). D11 We got up early tying to catch the terrace scenery in the early morning, we were all shocked by this amazing man-made work! In the afternoon, we drove forward to visit a primitive Miao village, where the natives were still live a very traditional life and the women were all working on their special technique by spinning, weaving, dyeing, embroidering, beating cloth and so on. They were sitting in several groups outside on squares by their wood houses in the village. D12 It is said the Dong people are very good at working on wood! Today we went to visit the very traditional Dong villages where we saw the drum towers, roofed bridges, village gates and other kinds of wood architectures. They showed the difference from Miao villages. Dong women are also good at textiles, especially in this region, many traditional techniques are more popular, embroidery, cross stitches, braid, the shining cloth are mainly produced here, it is dyed in indigo and brushed shines with egg white. D13 In the morning we walked around the Dong village of Yandong, we smelled something special, we dropped into a house, we felt the smell from the hot vapor braving from a bucket in a cauldron on the kitchen range. It was steaming the sticky rice that was the very favorite food by the people here. The ‘single-pillar’ drum tower, which looks like an umbrella with a main pillar in the middle, is taken on as the embryonic form to the other types of drum tower. Today we saw two of these, one old with a title of ‘national heritage conservation unit’, one new, rebuild 10 year ago. Dimen is a famous Dong village with many well-protected traditional wood architectures, special costumes with several good skillful textile working and especially the fine paper made all by hand with strong fiber from the mulberry tree bark, which were used to fold the ‘Shubao’ (paper box) for holding thread, cloth and other kinds of staff for textile. D14: Today we visited a Dong village, where we saw the most gorgeous Dong costumes. The women all well dressed were standing there with music instruments (so-called Pipa) in hands singing while playing them. Then they started to dance and we also joined them later. We had a funny moment then the women gave us the demonstration for their special embroidery and braid weaving. In the afternoon, we visited an ‘orange-thread-embroidery’ Miao village, where most of the Miao women were still wearing their traditional costumes during the daily work and some were sitting in groups by the roadside or in front of the houses to work on their textile work, they also had the up-side-down cross stitches as the Gejia people. Then another Miao village, where the Miao women were wearing the very short skirt. In this village the Miao women did less embroidery but more weaving and dyeing in indigo. They were weaving braid on looms! D15 Today we drove along a small road with very little traffic, the villages along were most primitive and little touched by tourists or visitors from outside. For a long drive, we just dropped into some villages and walked along the small paths here and there. The villages of two types of the Miao costumes could be seen along this way, the short skirt and Fanpai style!. D16 Visiting the red-thread embroidery and the tin-embroidery Miao villages. We of course had both techniques demonstration by the Miao women. D17 After taking 6-hours bus, we arrived the western part of this Province and had a very short visit to a Old Han village, where the people belong to the majority population in China, Han, but they are wearing the minority-style costumes, which is said the ancient costumes for the Han people over 600 years ago. And the houses in the villages were mostly built of stones. Stone world! Stay overnight in Liuzhi. combed the ‘long hair’ and make up their special headdress. It was raining, but we still visited the beautiful rural market there. D19 We almost spent the whole day in the village to see how the people weaving belt in special way. It was very interesting that the belts wearing by women are all woven by men, for which they can keep the secret of the techniques inside their village without being taken out by their married girls! So no girls are allowed to be taught this technique! D20 Fly home from today!